The Land Raider above was a fun one to make. 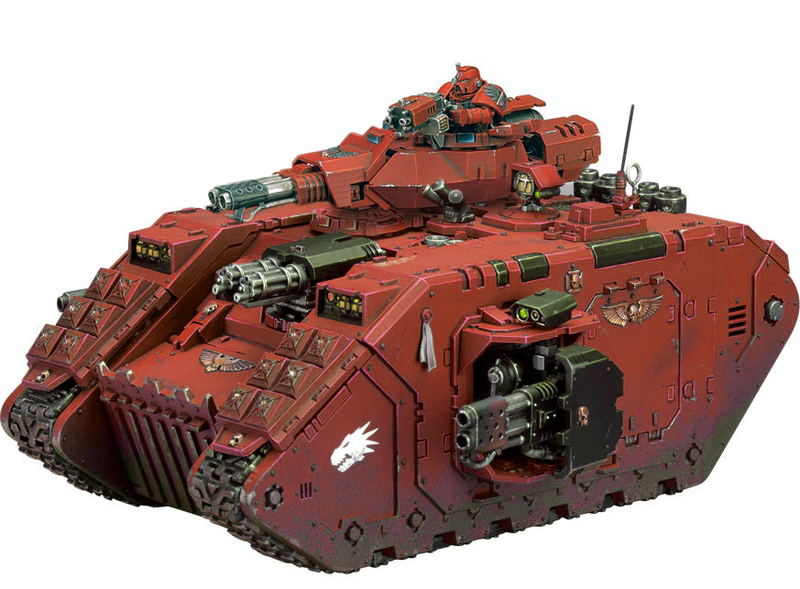 I seriously doubt that I will ever build this, but it was just a fun Idea for a Baal pattern Land Raider for an apocalypse game. 2 flamestorm cannon sponsons, and an Inferno cannon turret (The one with "torrent" from codex IG) on the top. maybe even trade that storm bolter for a heavy flamer if you really want to go over the top. 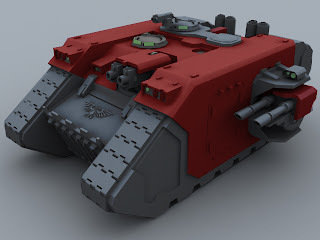 This picture was one of the first I did for my land raider. I just found a suitable image on google and changed the colors here and there until I found a scheme I liked. Even if you have just a little photoshop experience this can work since it is just a quick and dirty type thing, and it doesn't have to look super pretty, it just has to give you an idea of what it will be like. Here I wanted to see what robes would look like on my terminators, so I changed the original green robes on the left to the red robes on the left to match my army. I really don't like the idea of having a bright blue librarian in the middle of my black and red army, so I tested out a few different colors on the librarian as well. 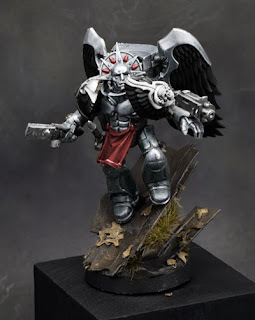 I thought that it might be cool to have silver Sanguinary Guard, so I made up this one real quick. It doesn't look to bad. 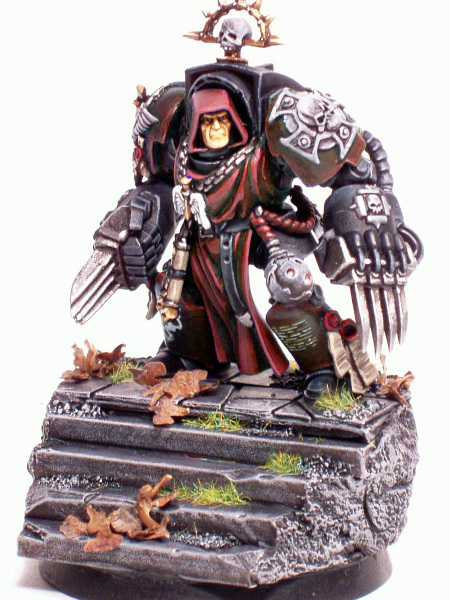 Another fun Idea for a conversion. Replacing the terminator chaplain's crozius arcanum with the apothecary's arm from the new Deathwing box (which I really want to get someday). This was a very easy photoshop job since the GW photos were from the exact same angle, so everything lined up nicely. 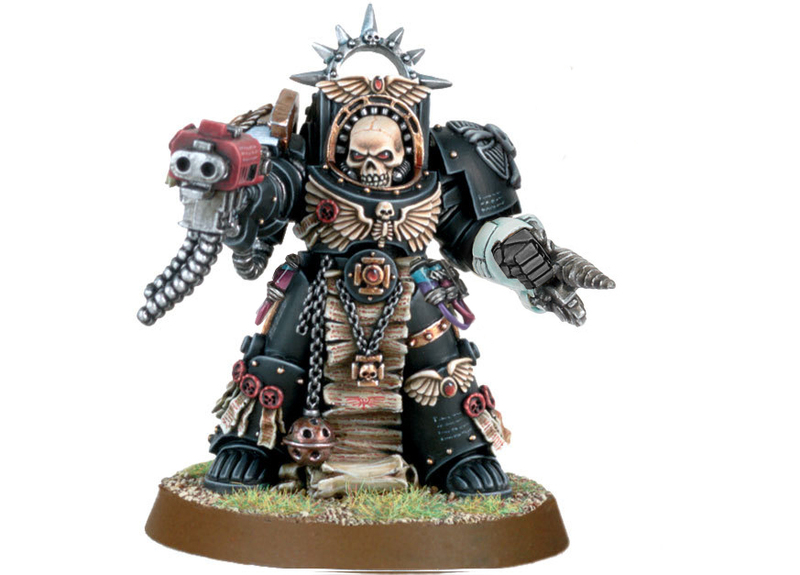 If/when I actually do this conversion I will also switch his storm bolter for a power axe also. 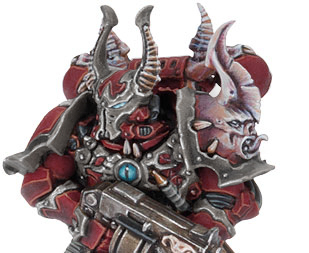 And to finish it off, we have some photoshop jobs I did to try to decide on a paint scheme for my Chaos marines (spoiler alert, I still haven't decided, but I'm leaning toward the red). Well that's it for now. Any of you with the photoshop skills already, you should definitely give this a try. 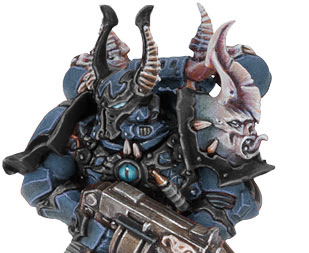 It is much nicer to realize that you don't like a color scheme on photoshop than to spend hours on painting a model only to have to strip it and start over. And for those of you who don't know your way around photoshop, I will probably be making a tutorial on how I do this. It really isn't all that hard to do, and doesn't take much time either. Thanks for reading, and hope you learned something you find useful! On the basis of the number of times people ask for one I guess I can try to say tutorial as many times as possible to get a tutorial on this. You seem to have some skills and have managed to do a great job of acurately changing colours, which is obviously helpful. please could you write up a tutorial? Well I guess It's decided then. Tutorial it is! Anything specific you would like to know besides changing the colors? Let me know and I can work it in. I am writing some papers, and this next week I have all my final exams for the quarter, so I will get to work on writing up the tutorial when that is done. And thanks for the comment! Okay, sorry I haven't made he tutorial yet. My mom was in the hospital over my spring break (she is much better now!) so I didn't have any time to finish it, and now school has started up again. I will try to get it soon. Sorry if you have been waiting. your comment on masterminis.net was reassuring to me. It has been quite a while since the draw. That and the fact that the time of giveway keeps getting put back. I understand that it keeps the affluence on this blog but with no real deadline the wait feels even longer. Yeah I know, it's a little weird how things with the giveaways keep changing, but then I remember that he is doing this for free at the same time that he is starting a new company. It probably isn't the highest on his priority list. 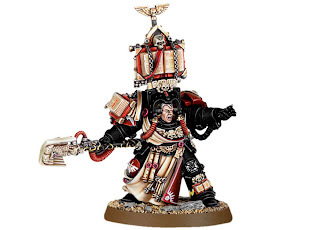 But still, I sure would like to get the codex as I'm sure you want Space Hulk. I'm not sure yet, but I may end up selling the codex (it's a great codex, but I'm not all that big into the limited edition thing) and trying to get myself a Space Hulk Set or something like that. When you get it will you tell me how you like the game? I know the models are beautiful, but I haven't heard what the game is like. There are several reviews out there on how the game plays(I found a batrep by miniwargaming) and it looks pretty good but I'll surely give you my opinion on it if I ever get a game in. About the giveaway. I do find it odd that he claims some of the prizes have been sent out when we haven't received any confirmation email. That and "The rest of the prizes will be sent out either this weekend or next monday." He said when givin the first winners he'd ask us to authenticate ourselves by posting a given comment on a that post of the blog. But I don't see any particular comments on this post. Maybe overwhelmed he skipped that step...which is quite worrisome when you think anyone could claim to be a winner and steal a prize. I have received a confirmation email(from my latest email) from Zaphod telling me I should receive my prize during the beginning of next week. Hope you received some good news too. Will tell you when it gets here!